When we got to the beach at 6am, John rigged up three of his rods. I thought he was gonna swallow the sinker. Our first catch ... a bonnethead shark at 6:35am. The second shark didn't even get to enjoy his Mayport shrimp. I tried to put our third shark out in the surf but it swam back to me the first three times. Mike walked out to put him in deeper water and he finally swam away. Me & shark #4 or 5. I lost count. There was nice light on this buried shell. This gives new meaning to the phrase, "man's best friend"!!! Actually, it's not what it looks like! Catch is sniffing John's bag of Mayport shrimp. Catch posed for a nice portrait. All of the pups like to meet John. I wonder if I would have been as brave if this was the mama shark? It was a good day overall. We caught 8 fish ... the first 5 were baby sharks. Waffle newbies are so much fun. They're overflowing with creativity. Emily made some watermelon slices. Travis made his home state of Idaho & a baked potato with sour cream/butter. Hmmm ... it's supposed to say Idaho, but it says You Da Ho. The Duck modeled so Rob could make an accurate Duck waffle. Emily posed with green peppers (it's an inside joke). It was funny that we both bought some at Publix for each other. I'm not sure what's more exhausting ... having a waffle party or blogging about it! 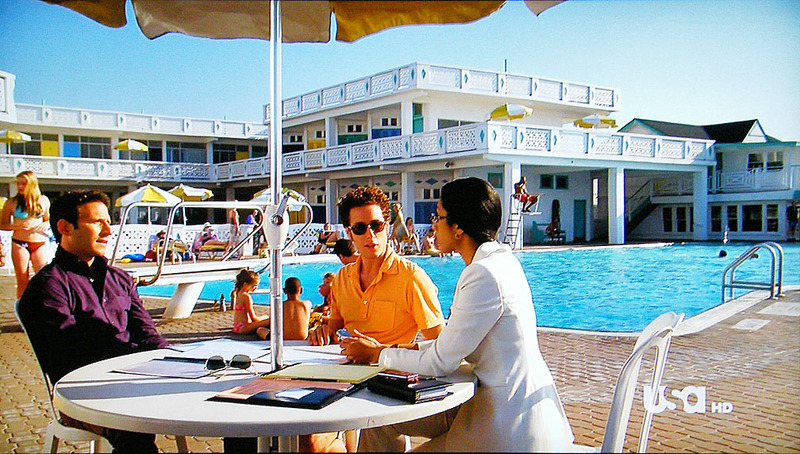 I've been going to Catalina Beach Club on Long Island, NY, well, since I was born. My grandfather built Catalina in the 1940s & it's been owned & operated by my family ever since. Even though I've lived in FL for over 25 years, I spent many summers there until I got a "real" job 3 years ago. I still go back every year with friends & family. It's one of my favorite places to photograph. 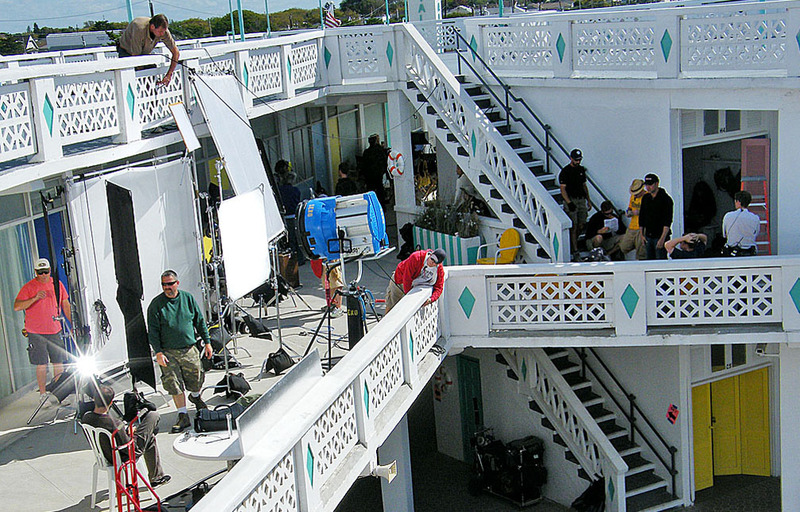 Catalina's old deco appeal is no stranger to big productions. Scenes in Goodfellas & Far From Heaven were filmed there. Herb Ritts photographed Sylvester Stallone there in 1985 for the cover of Vanity Fair & more recently Beyoncé was there for a shoot. The club has hosted many fashion shoots from Vogue & Glamour to the SI Swimsuit Issue. It's also a favorite location for tv commercials & catalog shoots. Tonight was the debut of a great new series on USA Network called Royal Pains. 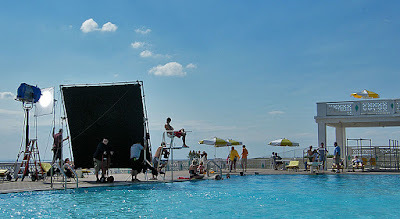 Last September I watched them film part of the series at the club. Tonight I got so see my cousins Andy, Sandra, Valerie, Molly & Ashley as "extras" in the show. Check it out ... Thursday nights at 10pm. 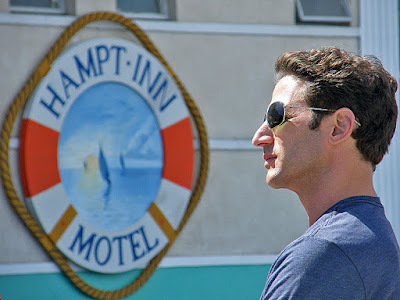 During the shoot, I met Mark Feuerstein, the star of the show. Nice guy. They converted one of the upstairs Oceanview cabanas into a motel room set.